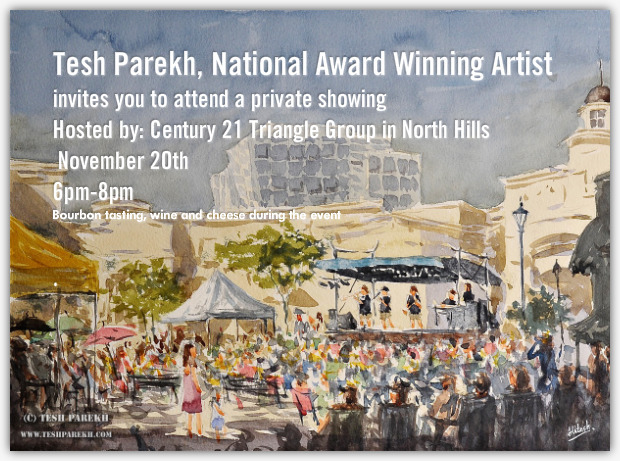 Tesh Parekh, Raleigh artist, is having a pop up gallery hosted by Century 21 Triangle Group on November 20th from 6pm-8pm. This event is a must attend. Tesh will show his latest work as well as some of his private watercolor collection. He is also currently displaying his work in the Fidelity Branch of Wake Forest. The art work is viewable during business hours. Tesh is a full-time artist and has been painting since he was 3 years old. He has won several awards throughout the country for his artwork. Watercolor is an easy medium for him, although that sounds like an oxymoron. However, he is able to work quickly and with ease with this medium and he can create a painting anywhere. Several of his watercolor paintings have been purchased, leased or published, and he is creating new paintings at a great pace.